Madhu B. Wangu, 9780972145916, 288pp. 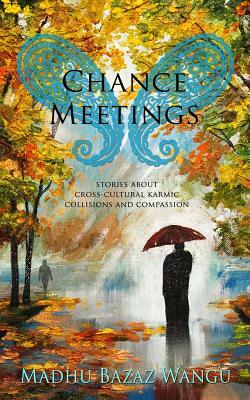 Chance Meetings: Stories About Cross-Cultural Karmic Collisions and Compassion In this eloquent collection of stories, twelve different people from different walks of life discover how one chance meeting with a stranger can change a person forever. Drawing from her own Indian-American heritage, Madhu Bazaz Wangu examines the lives of ordinary people facing challenging circumstances-cruelty, prejudiced minds, twisted family relationships, unhappy marriages-and demonstrates how these situations transcend ethnicity and background as interactions with strangers force each character to look deep within themselves, often acknowledging painful truths and long-held secrets, in order to seize control of their own destinies and forge their own paths to independence and happiness. Madhu Bazaz Wangu poignantly weaves a universal message that ties the characters in these stories together, one that applies to anyone who has experienced poverty, jealousy, fear, prejudice, disillusionment, and above all, the feeling of being a foreigner, even within one's own family. Story Summaries: Secret Healer: One small town boy's journey from the innocence of childhood to the injustices of servitude before finding shelter with an old man. Cadmium and Crimson: Two sculptors, one goal-to make masterpieces in three dimensions. The older dedicates his life to art and his younger contemporary to success. Where do their intentions lead them? Blackened Mirror: A successful artist discovers his authentic self. A Chance Meeting: A young man treats a total stranger the way he wants to be treated without expecting anything in return to amazing effect. Yellow Jacket: The protagonist is unable to resolve the guilt caused by the jealousy toward his younger brother as a result of his sudden death. The Thug: In an intense, frightful hour, a woman realizes the folly of gossip. A Precious Gift: After her son's death, a distraught woman learns from her old mother how to cope with loss. An American Dialogue A synchronic event changes a prejudiced woman's beliefs about a man from a religion other than her own. Darkness Behind Eyes: At the age of seventy-two, the deep driving desire of a woman who has wanted to learn to read since her teen years helps her achieve her goal. Gauri's Freedom: An arranged marriage dramatically alters a young woman's plans for her life until she meets another woman by chance who inspires her to take her life into her own hands through determination and self-sufficiency. Cycle of Life: A young, idealistic woman learns why and how life goes on despite suffering, anguish and physical pain. Portable Shrine: A writer discovers she is capable of more than she thought through the life lessons learned by the characters in her novel. Madhu B. Wangu Ph. D. Madhu.Wangu@me.com www.mindful-writers.com Madhu B. Wangu is an author, artist and the facilitator of Writing Meditation for Mindful Writers. She has a doctorate in the phenomenology of Religion from the University of Pittsburgh (1988) and a post-doctoral Fellowship from Harvard University (1989-1991). For fifteen years she taught Hindu and Buddhist art history at the University of Pittsburgh, Rhode Island College and Wheaton College. She joined Pennwriters Organization in 2005 and served as a Board member from 2007-10012. (www.Pennwriters.org) Madhu Wangu has written two books about goddesses, Images of Indian Goddesses: Myths, Meanings and Models, (Abhinav Publications, New Delhi, 2003) discusses the meaning of goddess myths and symbols. A Goddess is Born, her doctoral dissertation, (Spark Publishers, 2002) details the social, political, and cultural meanings of the Kashmiri goddess, Khir Bhavani. Madhu has written two extensively illustrated books for young adults, Hinduism (Facts on File, Inc., New York, 1991) and Buddhism (Facts on File, Inc., New York, 1993). She has held five one-person shows of oil paintings and prints and has exhibited with art groups in India as well as USA. Madhu has an abiding interest in the teachings of Asian religions as they relate to the theories of Carl G. Jung and the Jungian school. As a scholar of the phenomenology of religions, she finds the vast inner world of human psyche & Self as absorbing as the ultimate reality and human soul as taught by Asian thought. More than two decades of painting, meditating and writing has led her to write about the psychic world, its expression in visual arts and literature and the aesthetic pleasure one derives from these. Her debut collection of stories, Chance Meetings and her novel, An Immigrant Wife are to be released in 2015. She leads a weekly "Mindful Writers Group." Currently she is working on her second novel, The Last Suttee. She lives in Wexford, Pennsylvania, USA with her husband Manoj, a robotics engineer. They have two daughters-an avionics engineer and a pediatrician. Madhu and Manoj are blessed with two grandchildren.